Ever since my wife first told me about a "weird house with a scary octopus on the roof" where people say witchcraft is practised, I have been somewhat interested in this locus of lurid rumour -- though not quite enough to go to Bandung just to see it. 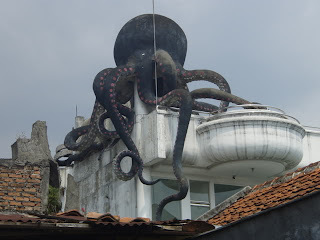 Located on Pasteur Road, the house has a statue of a large black cephalopod on its roof, grasping the house with its tentacles -- the design of the house itself suggests a submarine being grappled, and has seaweed-like ornamentation in places, which implies the sculpture was always part of the design. The house dates back to the 1980s at least. According to some sources, the octopus was originally pink, but the paint has mostly peeled away. You can still see pink paint on the suckers, in some photographs. The peeling paint and general disrepair of the house's exterior is often cited as one of the things that makes it so creepy. That article also features an interview with the head of the neighbourhood association, who says it's just an ordinary house, the octopus is a decorative cover for a water tank and he's never had any complaints. But then... he *would* say that, wouldn't he? Also noted by internet commenters are a number of stained glass windows, featuring playing card designs (picture at right), Jesus, 'figures of antiquity' and an inverted cross (I have yet to see pictures of any of these). How this squares with accounts where people claim to have knocked on the door and spoken with a caretaker is unclear. The neighbourhood watch guy in the article linked above says that they used to get a lot of people ringing the doorbell for a prank or a dare, so the people inside don't answer the door any more. This blog entry - http://ryanz-grill.blogspot.hk/2009/04/rumah-gurita-di-bandung-sebelum-tol.html - describes a 2009 visit where the door was answered by a portly Chinese man who said the owner used to be a sailor, and that he spends most of his time in Jakarta. A year earlier, the blogger "Manson Davis" had a similar visit, but when his videoed the conversation with the caretaker, his phone developed a mysterious glitch and the video file was corrupted. Manson Davis' blog is now offline and not on archive.org - just because it was on Friendster, or something more sinister? 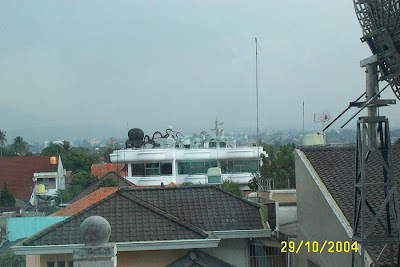 In fact, the house was raided by the cops in May this year - http://news.liputan6.com/read/601498/diduga-tempat-ritual-seks-bebas-polisi-periksa-rumah-gurita. As you might expect, they found nothing. A police spokesperson said it's just a normal house with three people living there.I suspect this will do little to affect the Octopus House's reputation. The most common theory about the house is that it is a church of Satan. Typical stories include a woman going to the house and leaving the next morning "sick and covered in scratches" -- and presumably with only hazy memories of what happened, although this isn't specified. This is tediously unimaginative but seems to be the only narrative with traction on Indonesian forums. One or two places suggest a link with the Illuminati, which is slightly more interesting but still not much off the beaten path. I hope someone can step forward in future with a new, compelling, mostly implausible but not outright falsifiable story that will give this piece of unusual architecture the occult, conspiratorial urban legend it deserves.